Lately, I’ve been thinking about different trifles to make. Several years ago when I couldn’t find a recipe for an Oreo Trifle, I made one up myself…and it was amazing. So, I’ve been brainstorming about different types of trifles to put together. As I was thinking about strawberries and cheesecake, the though of having these two together in a trifle sounded delicious. As the brainstorming process continued, I did a search on other recipes with a similar name or style as this one. Although they all sounded great, they didn’t sound exactly like what I was looking for. 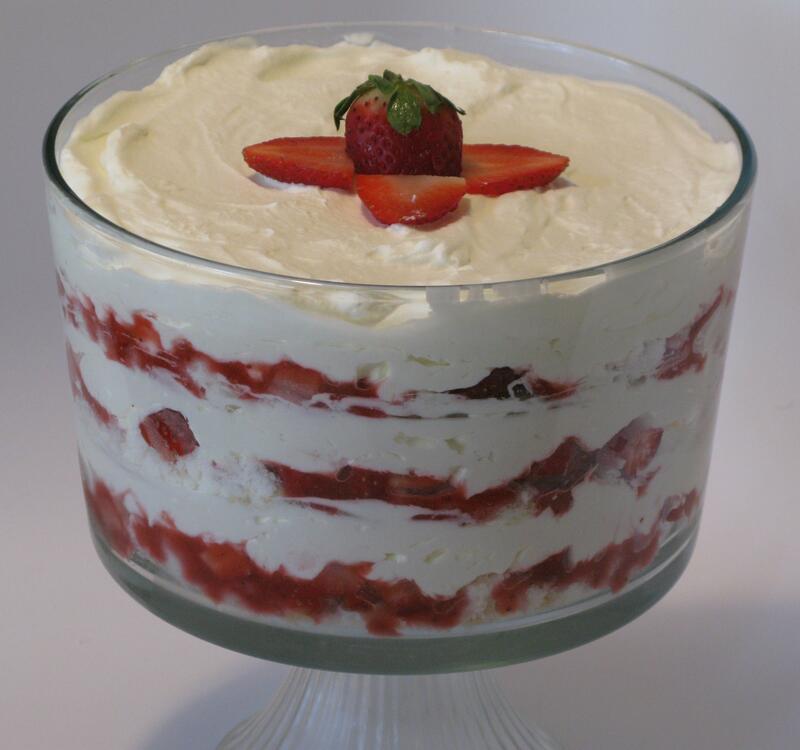 And honestly, to me the biggest difference of the trifle is the homemade strawberry sauce that is layered on top of the angel food cake and freshly cut strawberries. In my Tiramisu Trifle, the angel food cake and the Nilla wafers soak up the coffee, holding in all of that flavor and putting it together so well, and that’s what I wanted for this one as well. But, since the strawberry sauce is a lot thicker than coffee, there needed to be more of it, right? Right! I went to a post-Christmas gathering with some childhood friends that were in town visiting family, and showing up empty-handed just wasn’t an option. So, here was my chance. When I showed up with the dessert, I honestly didn’t think anyone was more excited about trying it out than me…until my friend’s fiancé saw it. Next thing I know, he’s sneaking off to the fridge in the garage where it was stored, and showed up with it in his hands, saying, “I just want to look at it.” He set it down on the counter in the kitchen and proceeded to stare at it. I laughed and said, “Do you want to go ahead and try it?” He smiled and whispered, “Can you serve it so I don’t get into trouble?” It was my pleasure. As we dug in, I sat there, shaking my head after each bite. I really do think that strawberry sauce made such a big difference with it…and even made it for a family gathering the very next day. Bring 1/2 cup water and 1/2 cup sugar to boil in saucepan on medium heat. Add two cups of strawberries, cook for about ten minutes or until strawberries are soft and mushy. Puree mixture, set aside to cool. Makes about 1 1/2 cups of sauce. In a medium bowl, beat cream cheese and powdered sugar with electric mixer at medium speed until smooth. Set aside 1 cup of Cool Whip for topping, add remaining Cool Whip to cream cheese mixture. Continue beating at medium speed until well blended. Divide angel food cake into three sections. Crumble one section into bottom of trifle dish. Sprinkle 1 cup of strawberries on top of crumbled cake, then drizzle 1/3 of strawberry sauce (about 1/2 cup) on top of strawberries and cake. Spread 1/3 of cream cheese mixture on top, repeat layering two more times. Spread reserved Cool Whip on top, store in refrigerator until ready to serve. **Make it light! Use sugar free angel food cake, reduced fat cream cheese and lite whipped topping. You’ll never notice the difference! Amazing!